All right, dear readers, it’s the last day of the new apartment tour! So far I’ve shown you the spacious entry, the living room, the kitchen, and the dining room. That leaves just the bedrooms and bathroom for today! 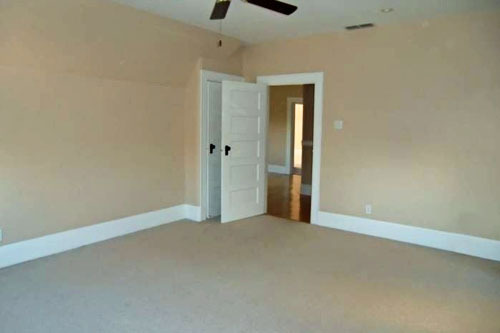 Again, these photos are from publicly available listings, unsourced to keep the address private. Right now the bedrooms aren’t anything particularly interesting, but they are a step up from the “white boxes” that are normally found in apartments. 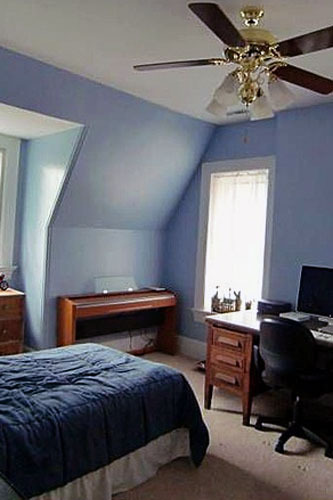 Instead of white, they’re very beige, and instead of boxes, they have great architectural interest that comes from being on the upper floor of an old building with a sloped roof. So there’s potential! I’m not sure where everything will go just yet, but the room is sizable enough that everything in our current bedroom should fit in here, if we want – the bed (a queen for now until I convince Mr. P that we neeeeeed a king) and nightstands, the dresser, a few bookshelves, and the television. 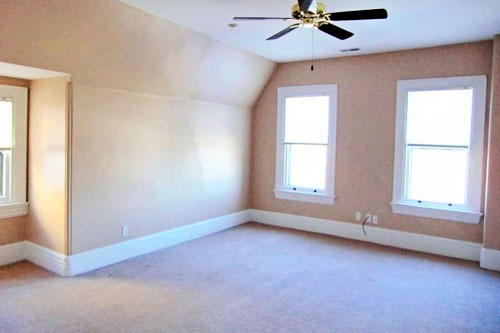 Yes, the television – you can see the room is already wired for cable! If you’re rolling your eyes and shaking your head disapprovingly, you just don’t appreciate SNL-in-bed enough. 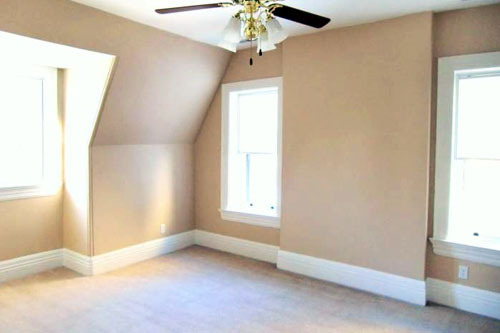 I honestly can’t remember how big the closet is, but I do think it’s deep enough to be considered “walk-in”. Still, I don’t know that all of my stuff and all of Mr. P’s stuff will fit in it, especially when you consider things like suits and dresses and winter coats. I think I might end up keeping some of my stuff in other closets. Not a big deal; it’s something I expected with apartments, especially old apartments. ... and yes, that is a very cookie-monster blue they’ve got going on, isn’t it? 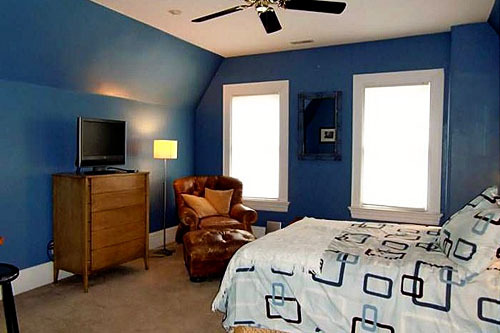 If you love blue, maybe that’s the shade for you, but this neutral-lover is so glad it’s been repainted beige. I intend to keep it that way, at least for a while. By the by, our lease doesn’t outright ban painting, but it does say that we’d have to get permission in writing from the landlady and that she has veto power (pretty standard). I’d lived here nearly five years before I started repainting the walls, so we’ll see if I ever get the itch to paint in the new place. At least, it’s “fun architectural interest” until I can’t put furniture where I want it because the walls jut out at funny angles. But hey, at least that transom window is never going to let me down. Love you, transom window. Those previous tenants, uh... really liked blue, I guess. Obviously the room doubled as an office for the previous tenant, judging by the giant desk. So there’s room for that if we choose to use the dining room as a dining room! Again, we’ll see how it all works out when our furniture is actually there. Finally, the last room in the place: the bathroom! Remember that I’d hoped for two bathrooms in our apartment, but this one only has one. 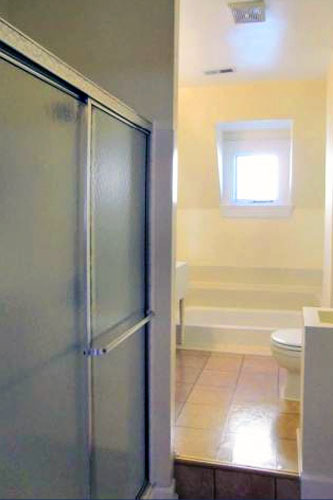 It’s a bit of a concession, but at least it’s a nice, large, updated bathroom. No pink or blue or seafoam green tile to be found! We currently have a large bathroom, and this one at least rivals its size – the shower alone is twice as big! I’m also really happy that there’s a separate shower and tub; we have that now and it’s great for us. Right now we have two, but really, I don’t get the allure of the double-sinks. So I’m fine with the single sink here, because it means more counter space... plus, the fixture is nicer than what we have now! 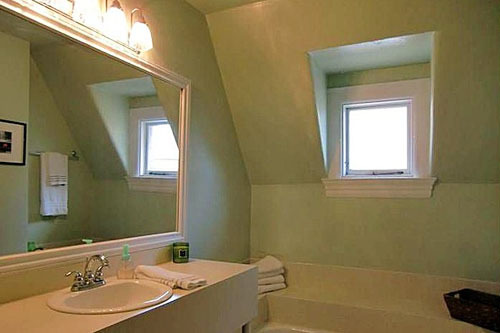 Note also that the bathroom is painted green here, when it was occupied by the previous tenant, but now it’s beige. I’ll have to think of fun ways to introduce interest or color before committing to painting enough to ask for permission! To the left of the counter is a medicine cabinet, where we can store the daily toiletries. If I remember correctly, there’s a shelf under the counter for storage, but no linen closet. Still, we have the large cabinetry in the foyer just outside the bathroom for that... or I may get this cabinet that I’ve had my eye on... but I’d have to paint it.... or prowl thrift shops for a lookalike... hmm. So that’s our new apartment! Hopefully now you can see why we chose it over the others, even with the higher rent. 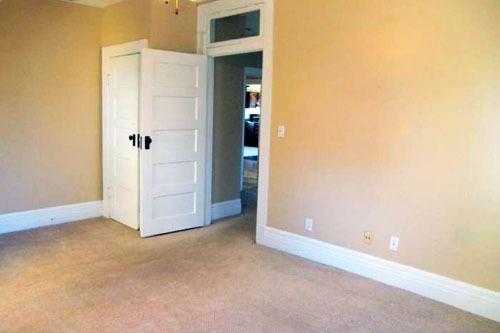 It’s an incredible blend of location, historic charm, nice upgraded fixtures, and tons of space and storage! Who wants to come stay with us and break in the guest room... and the wet bar in the butler’s pantry? I think my favorite part may actually the the doors. I'm tired of looking at builder-basic hollow core doors, and those are so gorgeous! Thanks for the tour! I am amazed at such a wonderful apartment find - as my favorite uncle would say, "you done good." Can't wait to see how you & Mr. P decorate this jewel!!! I’m a real-life red-headed stepchild, recently transplanted from Nashville, TN to St. Louis, MO, with my husband, Mr. P. Here you can read about my many projects as a real-life scientist pretending to be a designer in my spare time.